In colonial times, slaves and indentured servants had a hard life. Initially, Indentured servants are similar to slaves, but indentured servants had a choice to serve. 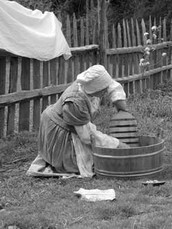 Cities and towns in colonial times had harbors where people traded goods. Some of those goods were slaves. However, some of the people who were purchased were actually temporary slaves. Whenever there was work to be done you would probably see slaves. To sum up, slaves and indentured servants had it harder than regular colonial people. An indentured servant is someone who worked without wages for a short period of time, in exchange for a passage to America. Indentured servants and the owner have to sign a contract called an indenture. This means that the owner provided food and shelter for an indentured servant. They had to work four to seven years. after their time was up they were free. Indentured servants were sometimes orphans or kids. Some people were even kidnapped and brought to America as indentured servants. Indentured servants weren't treated as badly as slaves. Slaves were unfree workers from Africa. First English settlers didn't have slaves, they had indentured servants. But it was cheaper to have slaves. Native Americans were used for slaves at first, but most died of Europeon diseases or ran away. So they used Africans. They were kidnapped from Africa and brought to America as slaves. Half died on the boat trip there, they probably were beaten, had a disease, or went mad. Once the slaves got to America, slaves were sold and taken away from their families. But that's just the beginning. Slaves worked in a field or as household servants. But most lived on plantation. In the plantation they lived in little cabins called quarters. This is where slaves ate, slept, and spent time together. 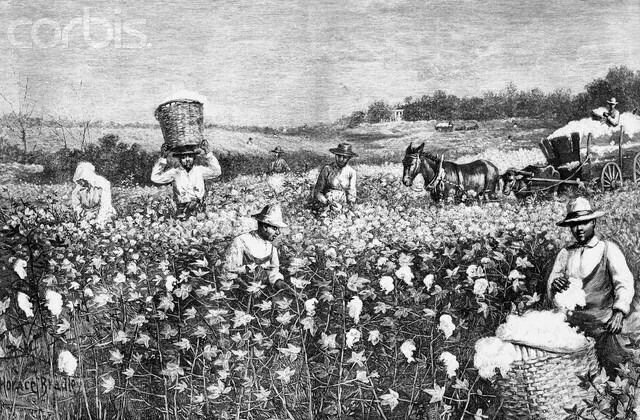 They picked crops like cotton, tobacco, rice, indigo, and sugar. They also worked in little houses and did special work like weaving cloth, sewing clothes, making candles, soap, and shoes. In addition, slaves also worked in factories, and they built railroads, and dug canals. Slaves could get whipped. They could get whipped from running away, and lots of other things. Life was very hard for a slave. Initially, nearly all workers in the south were unfree. After indentured servants worked their time, they could be free with a new opportunity for life. Slaves were packed on a boat for a rough ride to America. Also, slaves did all sorts of stressful back aching work. To conclude, life as a slave or an indentured servant was pretty much the hardest life in colonial times. Even though slavery was cruel, without slaves colonists would have never of had the towns and cities they have now. -Maier, Pauline "Indentured Servent" World Book Student. World book 2015. Web. 17 Feb. 2015. -Amidon Lusted, Marcia. "Not Everone was Free." Apple seeds. Sep 2011:24-26 SIRS Discover. Web. 05 Mar. 2015.